Leather backpack that is craftable, enchantable and standalone. From theRoadstrokers "Alvin Hews Annika Outfit". I'm releasing this with the permission from theRoadstroker. Thanks to theRoadstroker for letting me publish this. 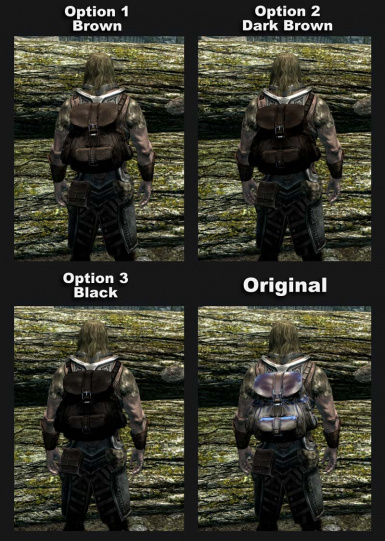 Now work with perk "Mage Armor"
This mod add a Leather Backpack. 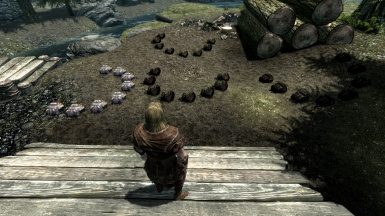 That is craftable, enchantable and standalone. Both female and male model. You can wear this with all your vanilla clothing. 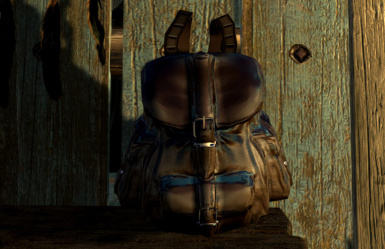 Get some awesome backpack textures here. The bag is craftable under the "Leather" category. You can choose one of the versions or you can mix any of them. Want one brown with shoulder straps, one black without and one with an enchantment of 100? Install all of them, they work side by side in-game. Main different is that one model comes without shoulder straps. So if you don't like the look with shoulder straps try the model without the straps. 50, 100, 300 increased carrying capacity. This WILL conflict with any mod that use the "47-Unnamed" Biped Object/equip slot. This means that you can only wear ONE of the conflicting items at a time. No crash because of this. Should not conflict with any other mods. 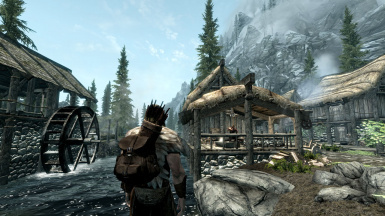 Installation with your choice of mod manager is recommended. Extract the folders "meshes" and "textures", and the .esp file inside your Data folder. 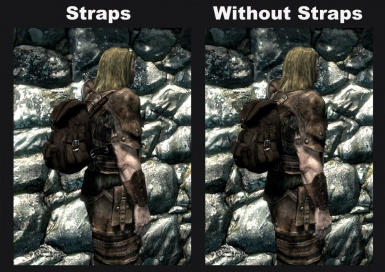 Make sure your character doesn't wear a backpack that increases carrying capacity when the mod is uninstalled. The stat change will remain for that character when the mod is gone. The backpack should be unequipped before uninstalling. This is true for all mods with enchantments that use special equip slots. Remove the extracted files from your Data folder. Please report any mistakes, bugs, errors or any other mishap.